In many ways, it’s like leaving your partner. After a long time of faith and love, there is physical pain as you have the first twinges of doubt. After a while, you realise your old love really has changed, and you consider the possibility that they’re lying to you, or they’ve abandoned you. Similarly, my relationship with Labour was strong, and then faded to nothing, just like a failed romance. I joined Labour at 16, when I first started to take an interest in student politics. I first voted on my 18th birthday, and proudly supported Labour candidates for elections, local and national. I involved myself in the Party, going from local youth & student officer to Chair of a local constituency branch. From President of a Labour student branch to sitting on the executive committee of Scottish Labour Students. From being a candidate, to being a Councillor. I committed to the Labour vision. To fairness, equality, diversity, and change. To a country where anyone could get a good education and work alongside anyone else, no matter what background. Over the course of 4 years, I campaigned for prominent Labour candidates, stood and won an election myself, and promoted Labour to all my friends. In short, I was a poster boy. I started to lose faith at the beginning of 2013, even though I’d become dubious with Ed’s leadership victory over David. I’ve been incredibly disappointed and angry, over and over, by Labour’s failure to even attempt to grab the initiative, especially in basic economic arguments. Why did we fail so incredibly to make the blatantly obvious case that Austerity is not working, but is destroying lives and plunging more and more of the poorest in our society into outright poverty? Why could we not muster the courage to provide a feasible alternative? Our own Shadow Work and Pensions Secretary, Liam Byrne, actually came out in favour of the welfare policies of the Coalition. Why have Labour not attacked the Conservative half of the Coalition on their economic focus to obliterate the benefits system in the most acerbic manner possible? We know the answer to this question: backbone (or lack thereof). Labour are scared to take a position on anything for the fear that some mythical voter with a fear of tax and a hatred of “skivers”, “soft” parties “fence-sitters”, and to whom they want to appeal, will decide they don’t like Labour’s position. This is sheer cowardice. 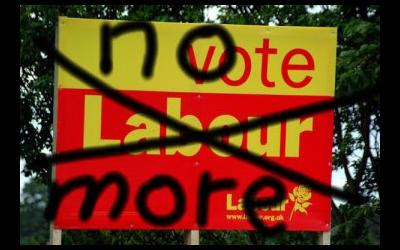 Why has Labour failed to come up with a cohesive and radical manifesto, rather than waiting for the Tories to fail, and then, when they do, eschewing any sort of initiative, but simply cowering in fear? Osborne has ruined the economy. He has flat-lined it with ill though out austerity, with an approach similar to running a bulldozer through a city to avoid traffic. Why does Labour not take the opportunity to hammer home this and the constant U-turns? Why does it allow Brown’s name to be sullied, when Labour knows the financial crisis was not due to his stewardship, but actually due to a worldwide economic credit fiasco presided over by bankers? It has consistently failed to engage in radical economic thinking, for fear of ceding further ground to the Tories. Every single act of the party is political positioning, rather than actual conviction in ideals. Why, when the economy is struggling, does Labour not attack the appalling elitism of the government, and make a cohesive and effective case for a bold and radical-left economic package? Where is Labour’s backbone? In March, after the scandalous subversion of democracy that was the Falkirk debacle, Labour simply backed down after the two witnesses suspiciously withdrew their statements, in what reeks of an example of Union bullying which harks back to the days before Thatcher imposed secret balloting, to stop this kind of thing happening. The Unions may have founded the Labour Party, but they have been growing consistently undemocratic. The members are forced to follow the whims of bosses who care more about lining their own pockets and advancing their own political careers, than what is best for the worker on the ground being paid minimum wage. McCluskey and his colleagues have a contempt for the working class that not even the Tories muster: Ed Miliband lets them walk all over him. As for Miliband himself, I really tried to believe in him. Even after the Budget, after Syria, after the debacle of his TUC speech, I still held a glimmer of hope that he could lead the Party I love to victory, and become this country’s next Prime Minister. But that hope just faded into an alternate universe with his latest reshuffle, and bad decisions coming out of Conference. Then came the policies for which I had been waiting a long time. I was surprised: all the policies, from the energy price freeze to the housing pledge, are fundamentally solid ideas, and the spark of hope re-appeared. But it’s been crushed by Miliband’s failure to do anything to flesh out and develop these ideas further. The energy price freeze could work, but only if a substantial progressive profit cap was initiated before 2015, to stop companies just hiking their fees before the freeze. This is simple stuff: Labour failed. And then, of course, the bedroom tax, or spare room subsidy. My disgust was not with the policy to repeal the measure, which I utterly oppose as preying on the poorest in society, itself, but with the overwhelming hypocrisy with which Labour made it. Miliband himself voted for it back in 2007. And the shameless hypocrisy does not end there. Labour, time and time again, takes a stand against tax avoiders. It blames the Conservatives for letting them get away with it. But, earlier this year, John Mills handed over £1.65 million worth of shares in JML, over to Labour, in a form that deliberately avoids any form of tax, fair or otherwise. Finally, the internal structure of Labour is entirely desolate and corrupt. Its culture has decayed to such a large extent that it no longer has the social capital necessary to function within itself. So many aren’t really interested in politics any more, but rather in their own careers and ambitions. All those with a position, especially in the mass toe-the-line outfit that is Labour Students, have a little rung on the ladder of power. They talk to each other like managers and executives, corporate suits, instead of like activists, campaigners and academics. We members of the Labour party seldom express opinions, and can’t be bothered to argue with each other any more. Labour will probably win the next election, and if I wanted a career in it, I’d be stupid to do what I’m doing. But I was never in Labour for the career, or the prestige. I was in Labour because I believe in something greater than myself. I believed in collectivism. I believed that, by working together, we could achieve much more together than we ever could alone. I believed in freedom, equality, diversity, and liberty. I believed in change. Labour no longer does. And that is why I’m leaving the Labour Party. I’m ending the relationship, handing back my keys, and shutting the door on what were some of the best, yet some of the worst, memories in my life. I’ll never forget my first campaigning day. Red badge glinting in the sun, red coat flapping in the wind, a smile on my face as I reached out to people to spread the Labour vision, which was also my vision. I’ll go on spreading that vision, but I’ll do it without Labour. Thanks for the memories, but goodnight, and goodbye.